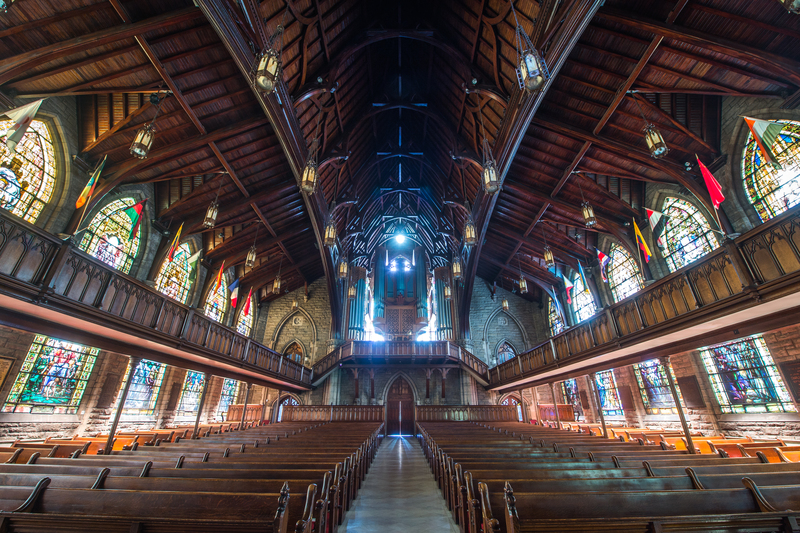 The First Presbyterian Church was designed in 1903 in a Gothic Revival style by Theophilus Parsons Chandler, a prolific architect of churches, mansions, bridges, train stations, a mausoleum and even the bear pits and monkey house at the Philadelphia Zoo. A leader in the architecture of churches, he later founded the University of Pennsylvania’s Department of Architecture. Tour guides will be available to discuss history of the congregation and features of the architecture. You can scan QR codes to read a devotional and description of each stained glass window in the sanctuary. First Presbyterian Church is built on land granted by the heirs of William Penn. The current building is the fourth on the site. It is a Gothic Revival style patterned after Yorkminster Cathedral in England, under the direction of architect Theophilus P. Chandler of Philadelphia. The building’s unique combination of wood, stone, and glass continues to marvel visitors from around the world. The central arches support two wooden beams, eighty-four feet long and two feet thick, which came from two trees in Oregon. The church has a unique collection of thirteen Tiffany Windows. Each window is hand painted on special “cathedral glass” and stand 26 feet high and 7.5 feet wide. A fourteenth window was made by the Charles and Frederick Lamb Studio. The great medallion window facing Sixth Avenue was the first of its kind in America, the work of famed designer William Willet. The current organ, installed in 1988 by Casavant Freres of St. Hyacinthe, Quebec, Canada, is one of the finest in the region, with over 4400 pipes and 77 ranks. A unique feature of the church are two giant shell doors behind the low pulpit (First Presbyterian Church has three pulpits, due to the importance of God’s Word.) The doors are 30 feet tall weighing two tons each, but are so perfectly balanced that they can be opened by one person. Behind the doors is the “chapel” and the great Stem of Jesse window depicting the genealogy of Jesus Christ. This window was the work of Clayton and Bell of London, England. On the west wall of the sanctuary is “Amor Caritas” (Love and Charity), a full length statue of an angel in flowing gown, by famed sculptor Augustus Saint-Gaudens. Similar works by Saint-Gaudens are in the Metropolitan Museum of Art, the Chicago Art Institute, and the Musee d’Orsay.